The Department of Social Anthropology, University of Bern, inaugurates its first lecture series Anthropology Talks. 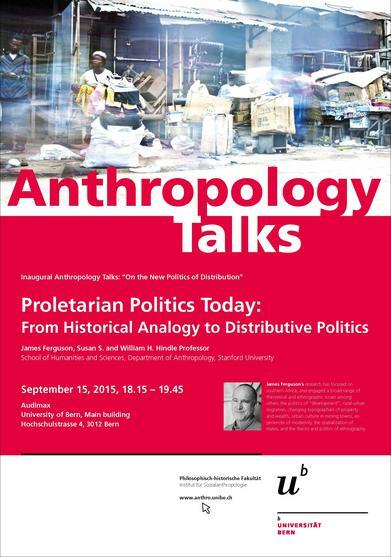 Inviting important scholars in social and cultural anthropology to discuss their latest work, Anthropology Talks 2015 presents James Ferguson, who will open the event with a public lecture on: Proletarian Politics Today: From Historical Analogy to Distributive Politics. James Ferguson is professor in the School of Humanities and Sciences, Department of Anthropology, Stanford University, and has recently been researching emerging trends in social assistance to alleviate poverty in southern Africa. While welfare programs in the West have been pared back in recent years, there has been a surprising expansion of social payments to the poor across much of the developing world. Tracing emerging new rationalities of poverty and social assistance, it aims to illuminate both the dangers and the possibilities presented by new mechanisms of “social” government and emerging forms of politics focused on the question of distribution. Anthropology Talks include a general reading in the evening of the first day, followed by two lectures in the two following mornings to a broad range of BA, MA and PhD students and workshop meetings for a selected audience (MAs, PhDs). The writings of James Ferguson, as well as other selected writings will be made available for all participants on ILIAS. This deepening exchange and reciprocal inputs form all sides are opportunities for students and staff members of the institute and as well as for invited scholars themselves.